Mix the ginger, mustard powder and smoked paprika in a bowl and divide the mixture in half. Add the oil to a frying pan over a medium heat and the chopped shallot and cook until caramelised. Add the passata and cook for 5 minutes before adding half the spice mix, vinegar, sugar, Worcestershire sauce, golden syrup and garlic. Cook for another 5 minutes. Using a hand blender, blitz the sauce until smooth. Season with salt and freshly ground black pepper and allow to cool completely. Rub the remaining spice mix into the steaks and leave them for 5 minutes. 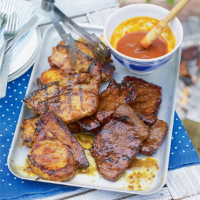 Pour ¾ of the barbecue sauce into a freezer bag, reserving the rest to serve with the cooked meat. Put the steaks into the bag and seal. Allow the steaks to marinate in the fridge for 15 minutes or longer if you’re preparing ahead. Barbecue the steaks until cooked all the way through, brushing with the sauce left in the freezer bag every 2-3 minutes. Serve the meat with the reserved sauce and a sprinkle of Heston from Waitrose Oak-Smoked Salt. Waitrose Reserve Shiraz, St Hallett 2009 Barossa Valley, S Australia is ideal for barbecued meats, with its ripe and rich core and hint of spice. For beer, try Bitburger Pilsner.